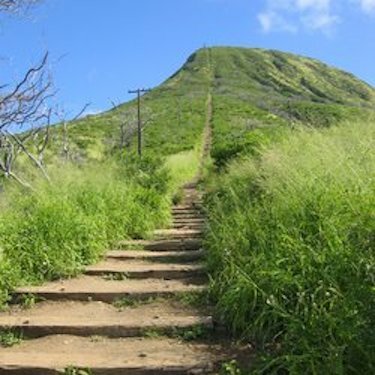 Hiking Kokohead while living in Hawaii was a wonderful experience, but not for the obvious reasons. The view was beyond beautiful overlooking Hanauma Bay. Being able to lookout over the marathon course from that perspective was mind-blowing. Hiking it with a dear friend makes it a forever treasured memory. The encounter we had with a man who hikes (runs!) this trail 3 times a day changed how I view not only this particular hike, but life in general. Seriously? A conversation with a stranger changes your life? Well, sort of. Perhaps life-changing is a bit extreme, but it brought to light a shift in perspective to which I refer often. This little exchange comes back to me frequently. The daily prompt title was “Make Me Smile” and asked to discuss things that make us happy. While not exactly that specific topic, I immediately thought of this hiker and his wise words on perspective. When we look at our Twitter feeds, Facebook walls, or even conversations with our friends, are our words peppered with complaints, sighs, and general negativity? If someone you didn’t know was to read everything you posted online, what would be their perspective? When spending time with friends, how do you come away feeling? Uplifted and content, or heavy and burdened? If we focus on the negative things in life, that’s what we will attract to ourselves. I’m not saying that every day is rainbows and kittens and life is always pleasant, because it’s not. Not by a long shot. Crap happens and life is messy. In general though, do we go through life complaining, resisting what is, or do we adapt and look for the good, seeking out joy despite circumstances? For some of us, I think it may come a bit easier as it’s in our nature to be positive, and in turn, if the natural tendency is negative, that’s what flows most freely. What about you? What’s your perspective? Do you look at the world with a perpetual glass-half-full viewpoint or do you look for the negative, complain, but don’t really know why? Perhaps it’s time to “think differently” like my hiker friend! So do I! It comes naturally (most of the time), but I find that it’s not necessarily the case for everyone. A conversation with a friend prompted the post! Thanks for reading and commenting! Harder sometimes to do, but yes!!! Life is better when our focus is on the good stuff! Thank you for reading!